If you have a medical disability preventing you from working, you can apply for either Social Security Disability Insurance (SSDI) or Supplemental Security Income (SSI). Benefits from both of these programs include cash and medical care, however SSI is specifically for disabled and/or elderly individuals whose income and assets are extremely low. Social Security Disability Insurance, on the other hand, is available only for disabled individuals who have already worked for a certain number of years (to acquire “work credits”). If your application for SSDI benefits gets approved, you will receive monthly cash payments based on your personal earnings record (usually between $800 – $1,400 per month). After 24 months of collecting SSDI you become eligible for Medicare and potentially Medicaid as well. To determine whether you are indeed disabled and eligible to receive benefits based on your disability, the SSA begins with asking five questions, each of which you need to qualify for in order to be eligible for SSDI. The important part of claiming social security benefits is proving that you have a physical or mental condition that will last upwards of 1 year or result in death. This physical or mental condition has to prevent you from performing substantial gainful activity; which can leave a lot of room for discrepancy. The Social Security Administration (SSA) uses their own medical experts to determine eligibility (you must have a medically determinable condition) and the SSA takes into consideration your age, education, training, and work experience. If you are denied benefits by the SSA you are able to file an appeal, and it is in your best interest to seek out the counsel of an experienced social security disability attorney before filing your appeal. One important thing to note about social security disability lawyers is that these lawyers only get paid if you win your case, and their pay comes out of your back paid benefits (either 25% or $6,000, whichever is less). If you apply for SSDI benefits without an experienced attorney, you risk putting yourself at an unfair disadvantage. The Social Security rules are very intricate and complex, and you statistically have an increased chance of winning your case if you enlist the legal assistance of a social security disability lawyer. 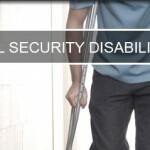 Contact LegalHelpLawyers.com to get in touch with an experienced social security disability lawyer today!